The Family of the Empress Helen of the Cross. A number of the "Roman" emperors are listed in the ancient British Khumric royal genealogies. The Khumric 'Lives of the Saints' state that Gwrtheyrin was a Prince from Rome who came into South West Wales to clear out Irish invaders. As Gwrtheyrin means Victorious we have a match with the Western Emperor named as Caesar Marcus Piavonius Victorinous Pius Felix Augustus who died AD 271. The 'Lives of the Saints' give details of genealogy which also allows us to date Gwrtheyrin-Victorinus fairly accurately and he falls into the correct time slot. 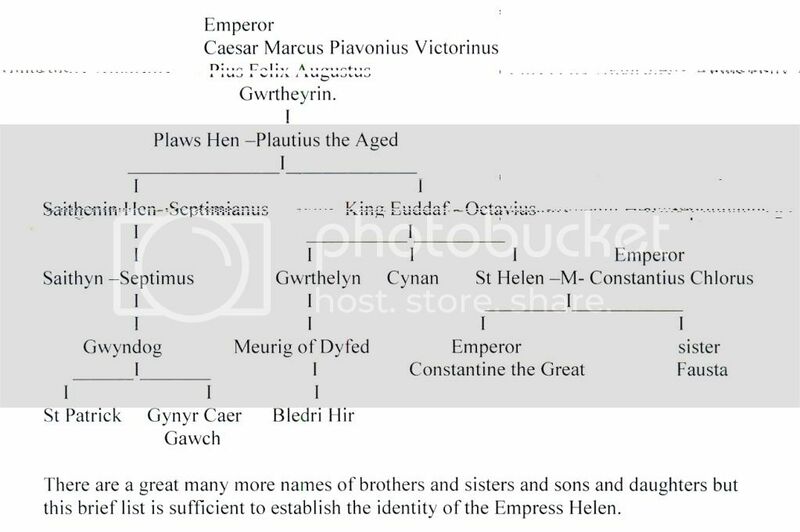 [center] [/center] There are a great many more names of brothers and sisters and sons and daughters but this brief list is sufficient to establish the identity of the Empress Helen. King Euddaf rebelled against the Lieutenants of Constantine the Great in AD 312, and by 322 he was ruling Britain independently. Gynyr Caer Gawch married Anna and their children were:- Nonn who married Sande (Alexander) and their son was David. Sadwrn Hen (Staturnus the Aged) who married St Canna and their son was Sadwrnin (Staturninus) Banhadlen who married a 'man from Italy' There is much more that could be stated.